I love to share creative ideas and different ways to use the items found in the store. I wished I had more time to be this creative!! Today we’re talking about tea cups. So small and delicate, but yet so beautiful!! 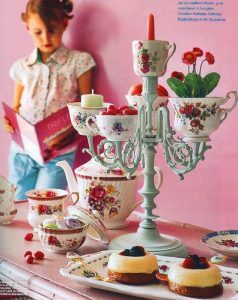 What better way to use Grandma’s tea cups and keep them close to you? This is such a sweet idea for a lamp. 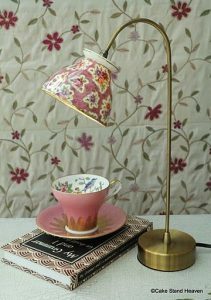 Pinterest has many more lamps made out of tea cups. I just love this candelabra made into a candle holder / plant stand. The colors are beautiful and can you image this on your dessert table? 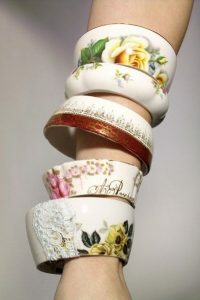 There are no words for these bracelets, except creative and stunning!! Who would have thought?